Jake MacArthur focused on energy efficiency opportunities at REI's headquarters in Kent, Washington. REI enlisted two fellows during the summer of 2011. One of the fellows, Jake MacArthur focused his efforts on energy efficiency at the cooperative’s headquarters in Kent, Washington. 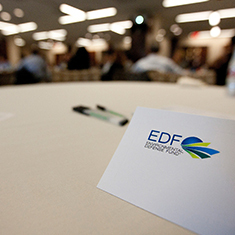 REI previously participated in EDF Climate Corps in 2010 and has a cross-functional energy team working to improve energy efficiency throughout the cooperative. The Corporate Social Responsibility team works to reduce the impact of corporate facilities while the Retail Energy Manager focuses on the retail locations. REI evaluates projects according to strict financial guidelines, evaluating them against other business investment opportunities. MacArthur proposed a broad range of projects at the headquarters, including energy star equipment upgrades, vending machine misers and multiple sensor-based wireless lighting projects. In addition, the fellows helped to chart a road map for future improvements and assisted with green power purchasing. In total, on an annual basis, the projects could cut 490,000 kilowatt hours of electricity use, save $53,000 and reduce 490 metric tons of CO2 emissions. Jake MacArthur, a student at the University of California, Santa Barbara was hired as a 2011 EDF Climate Corps fellow at REI.